With two Fed members discussing a possible tapering of QE, the euro-dollar forex rate struggled for gains and slipped back below the $1.2900 level to $1.2880. Despite the move, the pair did manage to finish unchanged on the day following some earlier strength. On the forex markets, the EUR/USD pair took another sharp move to the downside yesterday. Preliminary data showed that Eurozone GDP contracted by 0.2% in the first quarter which, when paired with worse-than-expected German GDP, saw the euro fall to $1.2875. In FX spread trading, the euro-dollar pair made a further move away from its most recent trading range yesterday, increasing the distance from $1.3000 by closing at $1.2935. Relatively bad economic data from Europe, with a lower than expected Zew Index number, put pressure on the euro when compared to the stronger US economic indications. Having traded as low as $1.2940 during the session, the euro-dollar market ended the day fairly unchanged at $1.2980. The pair will have all eyes on the German Zew data out this morning as well as Wednesday's GDP data. The euro/dollar market has broken out of its most recent trend by moving to the downside, with the currency pair now sitting at $1.2965. The dollar has been given a boost by strong US economic figures and renewed hopes that the Fed's stimulus will be cut back. 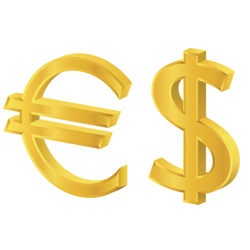 The euro/dollar FX pair is still trading in the range that it has held for most of April and May, but yesterday the pair moved towards the lower echelons of the territory. The strengthening of the dollar came on the back of better-than-expected weekly jobless claims in the US. This helped dismiss any fears that the US economy might be entering a difficult period. The euro appreciated against the dollar yesterday as strong German data gave the single currency a lift. German Industrial output rose by 1.2% in March, however, whilst this has calmed fears about the state of the Eurozone's largest economy, it has also reduced the likelihood of another rate cut in the short-term. In currency trading, the EUR/USD pair looks comfortable in its current range between $1.30 and $1.32 and will need to break either of these markers to set a clearer direction going forward. The euro did see a move to the upside during yesterday's trading, but after an hour or two the pair decided that it didn't like it up there and came back down to settle mostly flat. Following the ECB rate cut last week, Mario Draghi yesterday mentioned that further cuts could be possible in the future. The euro fell about 40 points, but surely Draghi's comments were not unexpected. Since this news, the EUR/USD forex spread trading pair has traded in a very tight range, waiting for the next catalyst to dictate direction. This could come at 11am (London time) today when we have German factory orders preceded by French Industrial production.